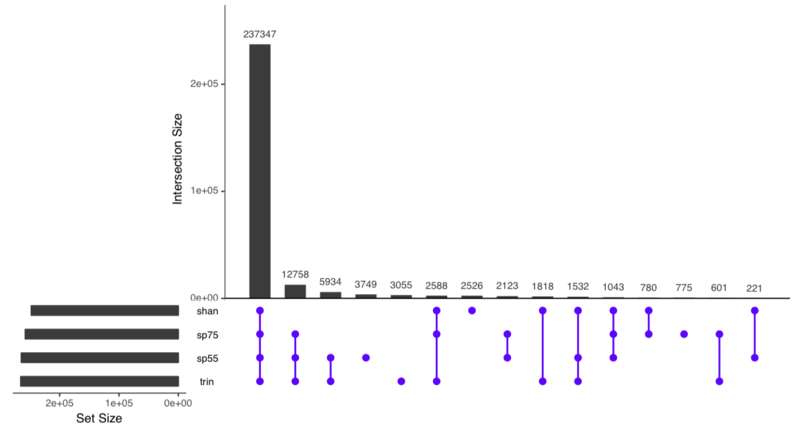 To benchmark the protocol, I used 15 publicly available RNAseq datasets of different sizes. All were eukaryotes. Here are the highlights. 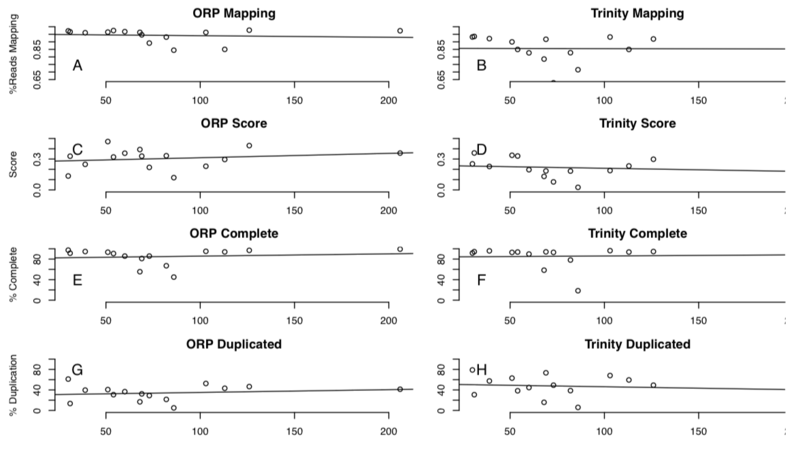 Rate of Read mapping and TransRate scores are massively improved when using the ORP, compared to a vanilla Trinity assembly. Guys this is really big. Assuming reads are descendent from the biological sample under study (as opposed to being a contaminate), mapping more reads means that the assembly is more representative of the sample itself. Further, the transcripts from which the reads that don't map are derived, are invisible to all downstream analysis. FWIW, all these differences are statistically significant. 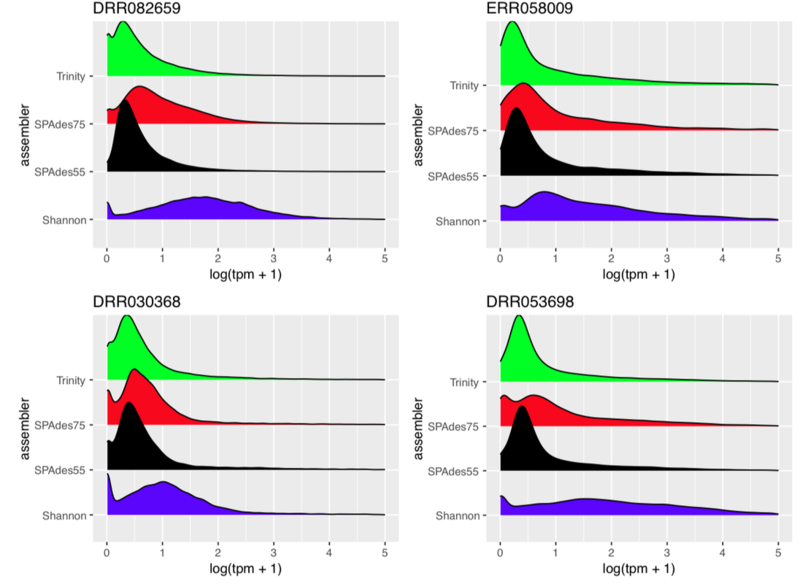 Each assembler different biases, and these biases are evident when looking at gene expression. Here are data from 4 representative merged assemblies. From each of these assemblies, I separated out the transcripts by their assembler-of-origin, and plotted the distributions of estimates of gene expression. Trinity generally does a good job of assembling low abundance transcripts, while Shanon may do a better job of assembling high-abundance things.. Also, if you know something about assembly algorithms, you'd know that longer kmers are better at assembling higher-abundance transcripts, and shorter kmers are better at assembling lover-abundance transcripts. Hey, we see this in the SPAdes 55 versus 75 assemblies. Neat! To the best of my knowledge, this expression profile has never been described and I think is really insightful. If you could only assemble with 1 assembler, could this type of analysis help you decide which one to use? Most assemblers assemble the same things, but also, each recovers some unique stuff. For instance, Spades k=55 recovers 3749 transcripts they none of the others recovered. What is something in this unique fraction was he most interesting thing ever.. If just used Trinity, you'd have missed it, and scary, you probably wouldn't have even known. Let's put this one to bed.. For eukaryotes, generating super-deep sequencing really does not help.. Just stop. Here are 4 metrics, and the regression lines. Note that they are all flat between 30-200 million paired reads. Look, you can sequence to 200M paired-reads, but if your goal is to assemble a transcriptome, you'd probably be well served to stop sequencing at 30 million reads. Dr. Matt MacManes is looking for a postdoctoral scholar to carry out research associated with a project focused on the genetic underpinnings of color pattern evolution in a mimetic radiation of poison frogs in Peru (see abstract below). The position would begin in the summer/fall of 2017, and be located at the University of New Hampshire. Desirable qualifications for this position include experience with modern approaches in genomics, and bioinformatics. Experience working on questions related to evolution is a plus. We encourage applications from minorities and under-represented groups of all kinds. Please email with questions, and if applying, include details about relevant experience, explaining your interest in the position, as well as a current CV, to Matt ( Matthew.MacManes@unh.edu ). Of note, Kyle Summers is looking for a PHD student to work on this same project - see http://www.balalab.com/fakenews/phd-position-in-the-summers-lab-ecu. PS: Thanks to Chris and Kyle for letting me borrow the text of this advert. The MacManes Lab is looking for a Masters student to participate in the desert mouse project!